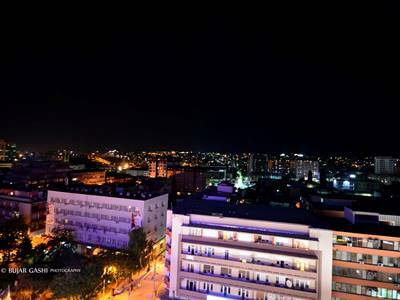 Pristina (also written as Prishtina) is the capital of the Republic of Kosovo. It is the largest city in the country. The municipality has around 200.000 inhabitants. Just like many other capitals in the world, Pristina is not the most beautiful town of the country. But, for sure it is by far the most important place of the young state. Pristina is the central spot for politics, media, student life and the international community. International organizations in Kosovo and embassies are in the Kosovo capital as well. In comparison with other towns in the country, Pristina has quite a lot of flats that look like former Soviet buildings. But the face of the capital is changing quickly. Many cheerful-looking apartments are being built. Also very attractive is the Mother Teresa Boulevard. The center street is full of restaurants, statues, fountains and the national theatre. Around 12 o’clock, it’s hard to find a spare chair in one of the cafes, when students and (international) governmental workers are having their lunch break. The majority of the inhabitants of Pristina (also written as Prishtina) have a muslim background, but other religious sights are easy to spot. For example, a huge new Catholic church has been built close to the university campus in the center. And of course, the fancy street in the middle of the center has the name Mother Teresa Boulevard. The parents of this famous Catholic nun were probably from Kosovo. Also relevant to know: there is a recently revealed Holocaust monument in the city. In 2016, they started building a synagogue. Parking your car in the city is in general just as expensive as drinking a coffee or a beer, 1 euro. Having a pizza, delicious salad, fish or meat will cost you between 3 and 8 euro’s. A tip is not required, but is of course very welcome in a country with very low wages. At night, there are many bars to visit. Ask locals for the best opportunities or read this blog with party tips. By the way, the Hamam Jazz Bar won an award in 2013 for beiing the best designed bar in the world. For other insights: read this blog of journalist Valerie Hopkins. 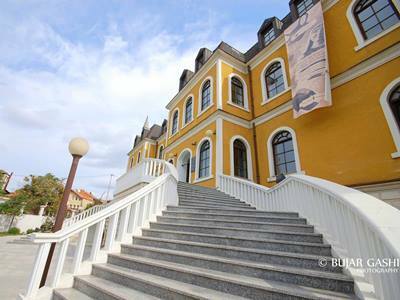 In the daytime, don’t forget to visit the NEWBORN Momument, the Bill Clinton Statue and the Ethnological Museum. The national library looks surprisingly ugly from the outside, but is surprisingly beautiful from the inside. For those who like shopping: you can take a taxi to one of the malls, just outside the city. Nice to know: The British singer Rita Ora was born in the Kosovo capital, Pristina. Her videoclip Shine Ya Light is recorded in her birthplace. Rita Ora is an ethnic Albanian, just like most of the inhabitants of the city. They write the name of the capital with a ‘h’ (Prishtina). Serbians say ‘Priština’. Another famous singer, Dua Lipa, is originally from this town. Just like Era Istrefi! A twenty minute drive out of Pristina will lead you to the international airport Adem Jashari. Do you want to read about other cities in Kosovo? Interested in tips about tourism in Kosovo? Check our Kosovo Tourism page. Curious about tips from real locals about food, culture, music, and shopping? Hjalmar Ã¤r numera mittback, helst viindkeraare sÃ¥dan. Att han ibland 2010 tvingades spelas vÃ¤nsterback berodde vÃ¤l pÃ¥ att det inte fanns bÃ¤ttre alternativ? VALE PEDIR LAS FOTOS AL FOTÃ“GRAFO QUE LAS SACO O POR LO MENOS DEJAR EL NOMBRE Y APELLIDO EN VEZ DE RECORTAR EL BORDE DONDE ESTÃN LOS MISMOS. Me parece una TOTAL FALTA DE RESPETO Y UNA COMPLETA FALTA DE PROFESIONALISMO TOMAR FOTOS DE INTERNET SIN MAS NI MÃS PARA UTILIZARLAS SIN DAR EL RECONOCIMIENTO A QUIEN LABURA DE ESTO.VERGÃœENZA!! Nemanau, kad bus pastebimai didesni, nei buvo GTA4 minimum. Kadangi Å¾aidimas matosi kuriamas ir konsolÄ—ms, vien iÅ¡ grafikos: 720p, nÄ—ra AA, maÅ¾as matomumas (konsoliÅ³ trailer).Tai Intel i5 ir GTX460 turÄ—tÅ³ pilnai pakakti low/medium. Vat 1920×1080 high settings su visais efektais, tai labai tikÄ—tina, kad reiks naujos 2GB vaizdo plokÅ¡tÄ—s, kokia GTX670 ar panaÅ¡i galbÅ«t kitais metais bus. Is it possible to find an underground parking garage for 15-20 days in Pristina ? Could you tell me if it could be possible and where in the city ? Could you help me? I would like to visit the surroundings of Prishtina and I need some information about bus lines, times and so on. Is there any tourism office in the town? Or something similar that can give me those information? Can you tell me how to book buses? I need a bus from Skopje to Pristina on 24 June. I also need a bus from pristina to podgorica or kotor on 25 June. Hi my name is Dan. I was wondering if you could send me any informational books on Pristina. Dear Daniel. Unfortunately, we don’t have any book about Pristina. In case you are interested in things to do, we advise you to download the Spotted By Locals app and then go to Pristina. We come to you to request tourism from your office. In addition, we request the tourist invitation letter. You tell us the terms and the amount to pay per person. You tell us the amount to pay and the terms and conditions. Dear Blanchar. Thank you for your message! Unfortunately for you, we don’t offer what you request. We wish you better luck somewhere else!